What do you get when a bike museum, a racing hall of fame, and sustained civic support intersect? A (fill in superlative) two day party, the kind that is VERY hard to leave. Saturday night in Davis, I rode on slick black streets. Headlights glared and turn signals blinked all around me. Never saw so many pedestrians out in the rain before! I met about thirty people ranging from the enthusiastic Ruth Asmundsen (mayor of Davis), to the artist Emily Elders, who will illustrate my book. And Olympic medalist George Mount, his wife Caryne, and their two girls. Jeannie Golay (who ruled US road racing, pursuit AND time trialling in the nineties) wore a swishy chiffon with big white polka dots (note to reader: I didn’t get my polka dot smoking jacket done in time to wear it…just as well). One goal of the festivities is to smooth the USBHOF’s transition from East to West Coast. For a couple of years, the N.J. based nonprofit had no home. In Davis, space seems available, new people are ready to make it happen. Davis benefits hugely from its university student population willing to try bike transit in this pancake flat locale, and from a markedly pro- bicycle establishment, quite the reverse of most cities and towns. I gave away boast cards. Sold five 2009 calendars. J. Heine’s art book (The Competition Bicycle) incited much buzz without getting grease stained pages. Lovely Peloton cellars wine flowed, and I “enjoyed immoderation”. City bike coordinator Tara Goddard took me under her wing for the night, driving me and dampcycle to her place, where I fell in love with Baxter, the frecklefaced border collie. Next day: gadding about with Peter Rich, learning about NorCal bike racing history straight from the Arabian Whisperer’s mouth. 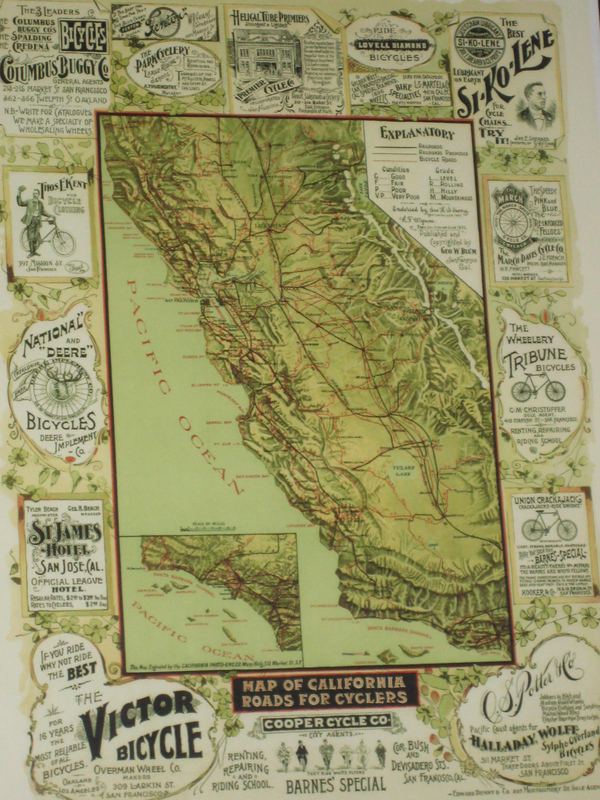 The seven week crosscontinental tour with fourteen boy racers, including George Mount…The first ever Tour of California stage race. The 200 mile “Davis Double”, raced as a twelve-man, eight hour time trial, just to advertise the Velosport Bicycle team. Also there were the Tales from the 45 years in the bike shop biz…The woman employee who confused the Fuji “Inter-national” and the Raleigh “Super Course” with disastrous results. The police chief who was unamused by Peter’s offer to sign him up in the “50-50 club” (for guys fifty and over who are fifty pounds overweight…but in pleece lingo, ‘5150’ is code for a lunatic). Two hours or more at the current site of the California Bicycle Museum in the heart of town. Coming and going: Jackie Simes, the Stetina brothers, John Hanst, Fred Hillis, Owen Mulholland. John Hess (researcher by day, museum maker by night) treated us to fine burgers and beer. First restaurant in…oh, two years. His wife Katherine took time off work to join us, as students came and went, each group looking younger than the previous. Impossible not to fret about what a chewed-up planet my generation is handing down to these innocents. Evening’s gala: a brass ensemble played swing tunes outside Freeborn Hall, and a 90 decibel roar clobbered us once we were inside. The room had 320 diners in it, about 2/3 of whom were men. Dinner was served as the four inductees were feted. I forgot to eat, I was so floored by Cheri Elliot’s talk, Jeannie Golay’s talk, the mini-movies. Then came the two men being inducted, one posthumously. When question & answer time came, someone inquired when there would be a women’s Tour de France…none of the men on stage could say. IN other words: never, if left up to them. The status quo’s just fine. Mr Plant extolled “bike racing’s healthy lifestyle” while touting sponsors like Dupont, British American Tobacco and the egregious Donald Trump. I would like to know, guys: are there ANY sponsors you would turn down? We ladies may not get a Tour De France (as a rule, women don’t watch sports. We play them. Jane Kendrick Higgins remembered my beginning to race just when she was leaving, having raced very successfully here and abroad. We traded tales…I do think women’s racing (not to mention marketing sports to women) is essentially different from men’s. Most women haven’t the free time men seem to carve out for themselves, and face it, racing’s selfish. I’m gonna go out on a limb here, and say that fewer women are selfish than men…thus a smaller talent pool. (Shades of women’s selfish team issues?) . Exception to the above comment about status quo: if there were millions in federal grants to put on a women’s series, you can bet the fellas would stampede on over (Title 1X had an unintended side effect: hundreds of women coaches lost their university jobs to men) . Unless the grant stipulated a woman-owned sports marketing company, heh. I like to imagine creating events that combine public health, community and shared wealth. There may exist sponsors who comprehend the power of ideas like: strong, sane, sustainable. ~ by jacquiephelan on November 4, 2008. The irony in the link that came up under the (automatically generated) Possibly related posts is just too rich. Baxter fell in love with you, too, Jacquie. You were a delightful houseguest, and we’d be happy to have you again someday. It was a blast hanging out, glad you enjoyed the soiree. Ciao bella! That’s right! Whoops, I am sooo busted. It was a delicious one too. You and Chikako and I had just visited Black Mtn Cyclery… er, ok so I better revise, eh?